This is a belated *TILT *because we’re suffering with colds and hayfever here and the computer hasn’t been feeling too good either of late! 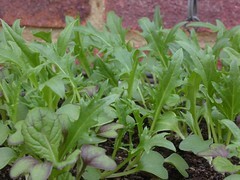 I never cease to be amazed at how quick the growing season here is in England. 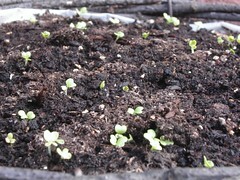 I planted this* lettuce seed* on Friday 21st April. I didn’t expect any of it to come up because most of it was out of date! But thought, I’d give it a bash anyway – what a bonus if anything actually appears. So, here we have some oriental lettuces – mizuna *& *red giant mustard. Shots are taken after one week then today at three weeks. Just incredible. I think the warmer weather interspersed with rain has helped enormously. I love watching things grow, especially things you can eat!